I picked up this issue of WORLD’S FINEST COMICS, despite its dollar price tag, because its lead story was going to wrap up the ongoing Martian Manhunter storyline that I had been following in recent issues of ADVENTURE COMICS, and that I liked quite a bit. So this was my first encounter with the phenomenon of one writer being called upon to finish up the work of another, and the dissonance that can happen as a result. But hey, that Neal Adams cover is pretty great. Based on the background colors, my guess is that Neal colored this one himself–those rich oranges and browns weren’t typical for a DC book in those days. 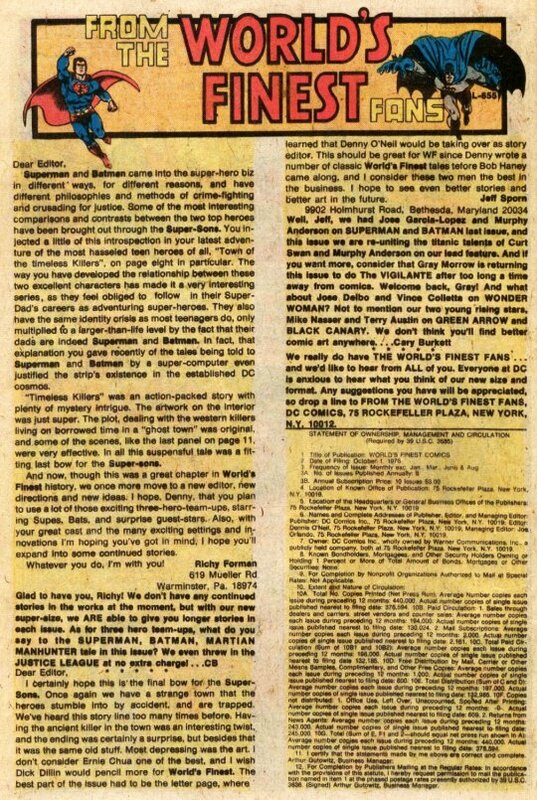 As I’ve mentioned elsewhere, Dollar Comics were one of new publisher Jenette Kahn’s initiatives in trying to create a package that would compete better on newsstands for retailers, and thus be given greater priority like other magazines. I don’t think it ever quite worked out that way, but it was an oversized format that DC kept going for a number of years. This issue, though, was a good example of the mixed bag that most books in the format evidences, in that the anthology format meant that you got some really good material and some that wasn’t of any real interest to you. As is often the case, the idea was stronger than the execution. The lead Superman/Batman story also conforms to that truism. 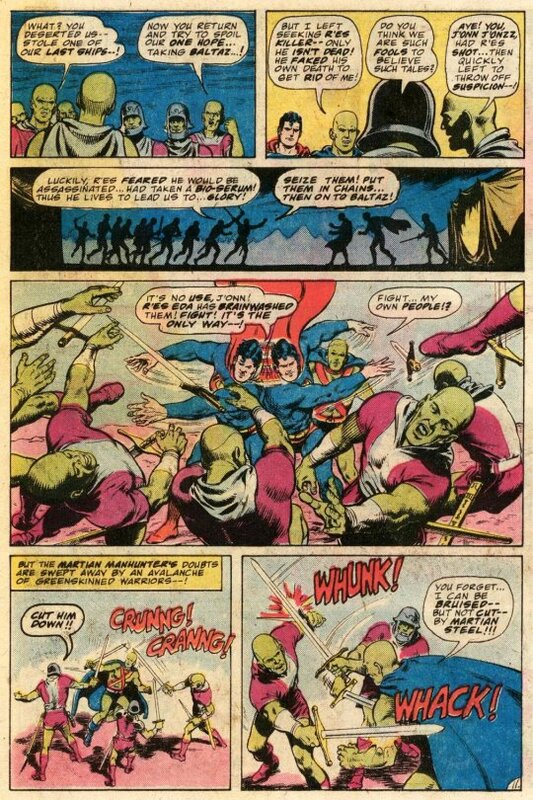 Writer Bob Haney, clearly having been tasked with wrapping up a J’onn J’onzz serial that he clearly had little interest in wastes no time in throwing out the central premise of that entire storyline: turns out that the murdered friend of J’onn’s whose murder set this tale in motion is actually still alive, and that it all has to do with another race of beings living at the core of the Martians’ new homeworld. 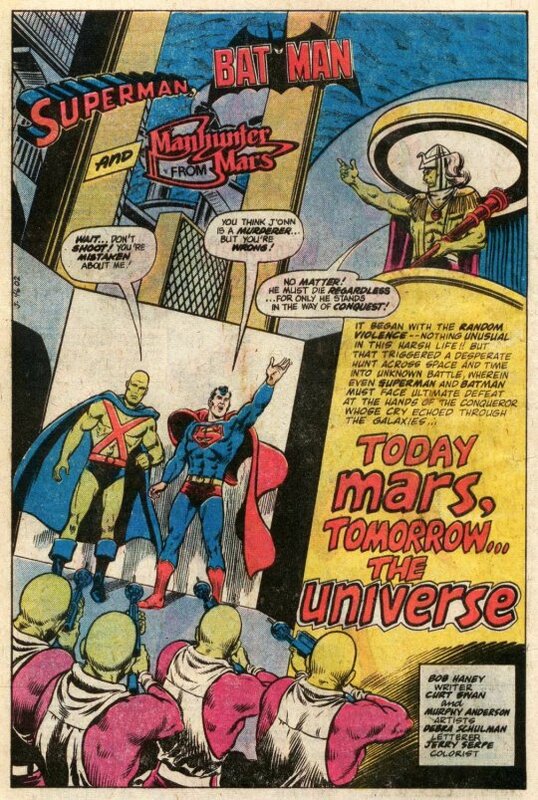 Superman and Batman abruptly show up out of nowhere (and Hawkman disappears mid-story just as mysteriously) to help the Martian Manhunter clear everything up. It’s about as unsatisfying a conclusion as one can get, but the Curt Swan artwork at least was lovely, inked by his collaborator Murphy Anderson to reunite the classic “Swanderson” art team. Next came the letters page, which included the Statement of Ownership, running a little bit late for some reason (did they perhaps skip the letters page in the preceding issue?) All of these sales figures are for the pre-Dollar Comic version of WORLD’S FINEST, but they reveal that the title was selling 132,185 copies on a print run of 378,594, for an efficiency of just under 35%. That’s in no way a good number, particularly for a book that starred Superman and Batman, so perhaps the decision to convert the series to a Dollar Comic was in part motivated in trying to save it. 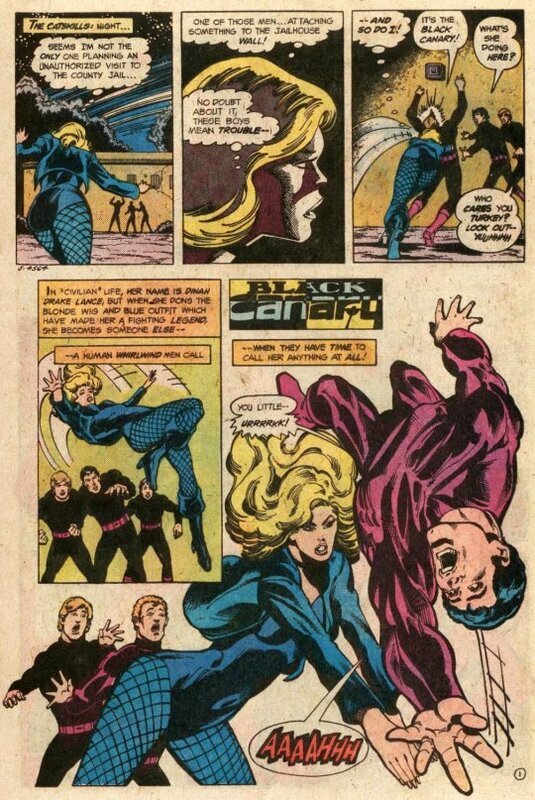 …and the Canary wastes no time in doing so, in the very next story, also handled by the same art team. Here, Dinah tracks down the Doctor responsible for making Ursus what he is, and is caught between the two–the latte having been driven to violence by an injection administered by the aforementioned Doctor. 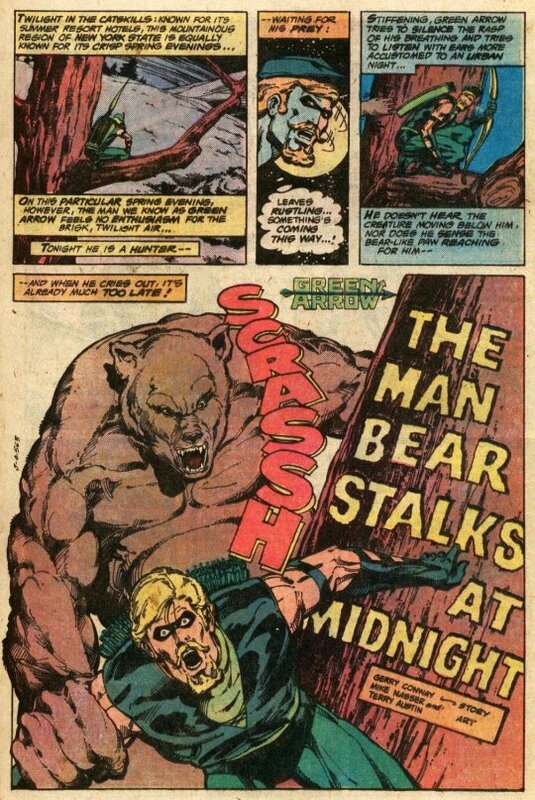 Dinah is able to hold her own, of course, and the two villains plunge to their deaths by story’s end, Ursus sacrificing himself to get his revenge. Which is a bit of a shame–Ursus was a pretty good character and more might have been done with him. 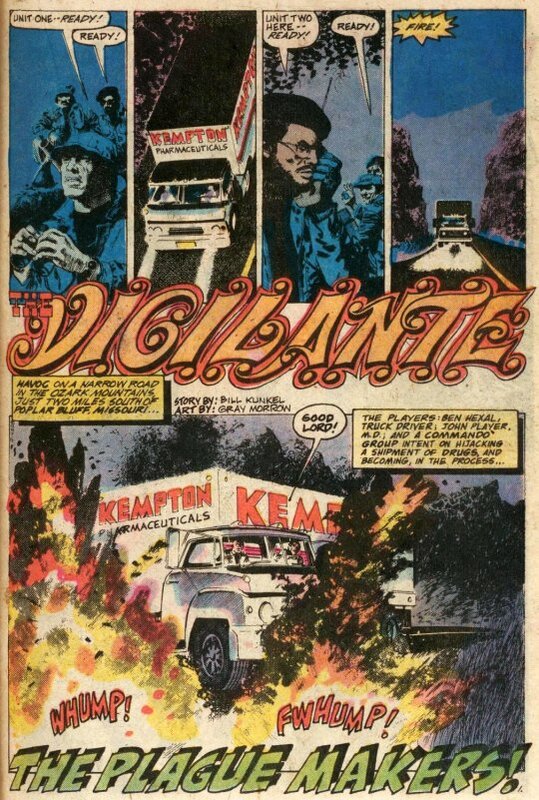 Next up came an adventure of the Vigilante, illustrated by comics great Gray Morrow. It’s a beautiful art job, simply stunning–but as a kid, I didn’t really care for it. The whole story was attempting to stay very grounded in the real works, with the non-powered Vigilante the only fantastic element in it–and that’s not what I wanted out of my super heroes at age ten. I also didn’t have any great affinity for westerns, so that all made this one a clunker in my youthful mind. 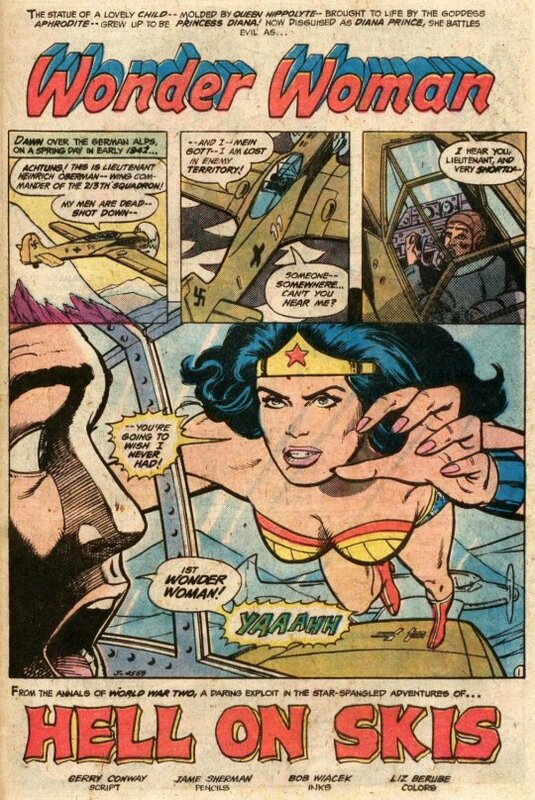 And the issue rounded out with a full-length Wonder Woman story set, like her recent television series and her own solo comic book at this point, during World War Two. It’s a pretty by-the-numbers affair, with a secret Nazi base and an evil Nazi commander called the Iron Claw. It didn’t make my pulse race, and I suspect that Diana was also sleepwalking through its events a little bit, having done this kind of thing so many times by this point. It was a functional story, but nothing that you were going to remember once you closed the comic.